Scientists have used tin and other abundant elements to create novel forms of perovskite—a photovoltaic crystalline material that’s thinner, more flexible, and easier to manufacture than silicon crystals. They report their research in the journal Science. The new device consists of two perovskite solar cells stacked in tandem. Each cell is printed on glass, but the same technology could be used to print the cells on plastic. 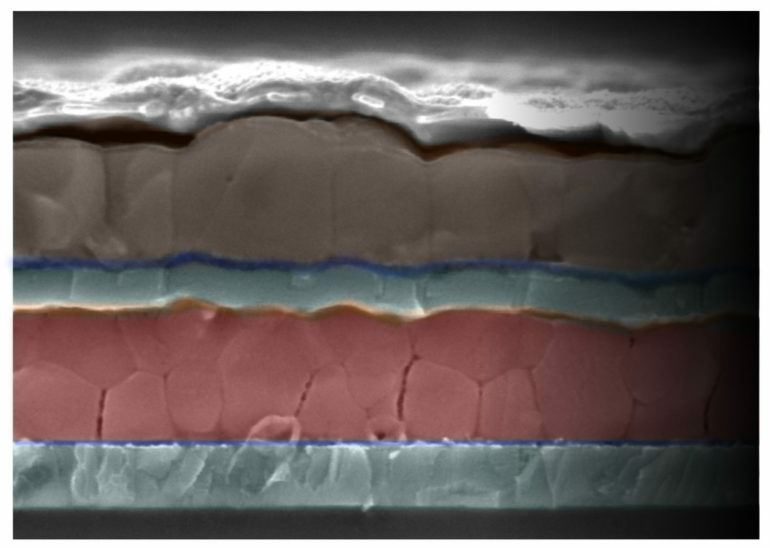 Previous studies showed that adding a layer of perovskite can improve the efficiency of silicon solar cells. But a tandem device consisting of two all-perovskite cells would be cheaper and less energy-intensive to build, scientists say. An efficient tandem device would consist of two ideally matched cells, says co-lead author Giles Eperon, an Oxford postdoctoral scholar currently at the University of Washington. The smaller gap has proven to be the bigger challenge for scientists. Working together, Eperon and Leijtens used a unique combination of tin, lead, cesium, iodine, and organic materials to create an efficient cell with a small energy gap. “Crucially, we found that our cells exhibit excellent thermal and atmospheric stability, unprecedented for tin-based perovskites,” the authors write. The next step is to optimize the composition of the materials to absorb more light and generate an even higher current, Snaith says. “The versatility of perovskites, the low cost of materials and manufacturing, now coupled with the potential to achieve very high efficiencies, will be transformative to the photovoltaic industry once manufacturability and acceptable stability are also proven,” he says. Other researchers from Stanford, Oxford, Hasselt University in Belgium, and SunPreme Inc. are coauthors of the study. Funding came from the Graphene Flagship, The Leverhulme Trust, the UK Engineering and Physical Sciences Research Council, European Union Seventh Framework Programme, Horizon 2020, the US Office of Naval Research, and the Global Climate and Energy Project at Stanford.